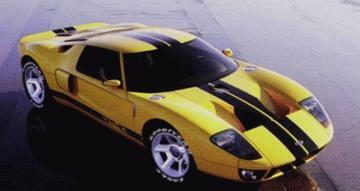 My favorite car of all time is the GT40. Ford has unveiled an updated concept which looks like it could be a Viper, Vette, (you name the marque halo car) beater. Sweet. Yup, love it! Too bad I probably cannot afford one. Arrgh! I have a little picture of an original GT40 at work. I'll try to remember to bring it home so I can scan and post it. Those cars are absolutely gorgeous. I'm totally glad Ford is bringing them back. Here's a little video of the introduction. They fire it up at the end and man it sounds good! I heard if Ford make that car, it will share many parts with the upcoming small Aston martin mid-engine coupe. not sure, just something i heard.